This post was written for inclusion in the monthly Authentic Parenting Blog Carnival hosted by Authentic Parenting and Living Peacefully with Children. This month our participants have written about babywearing. We hope you enjoy this month’s posts and consider joining us next month when we share about anger. Babywearing results in less crying. When you are right there with your child, you are better able to read cues in the moment. This means that babies don’t have to resort to crying to try and communicate their needs. Their needs are met before they reach that point of desperation. Babywearing leaves more time for learning. Crying is exhausting and really takes a lot out of babies. Babies who are worn tend to be in a calm, attentive state, perfect for learning. They spend less time recuperating and more time taking in the world around them. They also have a better view than the one they would have sitting in a stroller or other contraption. They are up at an adult’s vantage point, ready to interact with the people around them. Babywearing helps babies regulate. Up until birth, a baby has not had to depend completely on their body’s own systems. Suddenly, their bodies are forced to contend on their own. When babies are worn in a sling or carrier, the adult’s body helps them to regulate their own. The baby will tune into the adult, regulating his/her own bodily systems, such as respiration. Babywearing allows for easier bonding. A mother’s oxytocin levels are increased through physical contact with her baby. This leads to a more intimate bond, lessnes the incidences of postpartum depression, and aids in breastfeeding. Babywearing with other adults similarly aids in the bonding between the baby and that adult. Babywearing leaves your hands free. Taking care of an infant, or toddler, takes up quite a bit of time, leaving you with less time to do necessary everyday things or find some time for yourself. By wearing your baby, you leave your hands free. Your baby is content, and you can get some things done. Babywearing leads to more confident parents. Parenting is hard, and many parents question whether or not they are doing a good enough job. A content baby who is learning and cries less aids in making more confident parents, who in turn will be more likely to meet their child’s needs in a secure and gentle fashion. Babywearing can be done virtually anywhere. You can wear your baby virtually anywhere you would otherwise take your baby. You don’t have to worry about pushing a stroller in rough conditions or lugging it around. There is no need to fit a bulky car seat in the cart when shopping (the AAP recommends that infants should not be in car seats unless they are in the car). Babywearing allows you to be just as mobile as you were before the baby was born. Babywearing affords better sleep for baby. Many babies sleep better when in contact with a loving adult. Babywearing affords better sleep for baby. Babywearing counts for tummy time. When a baby is worn, they learn to counter themselves against the gentle sway of the parent’s motions while receiving the amount of support they need for their current stage. This helps strengthen core muscles. Babywearing gives babies control over themselves. Babywearing allows babies the opportunity to turn away from the world when they are overstimulated. This results in children who can chill out before reaching melt-down. The next time someone gives you grief about babywearing, reply that this is what works for you, and then throw in a fact about babywearing. Eventually, as they see your secure happy child and you share various facts with them, they will most likely give up on trying to talk you out of it. 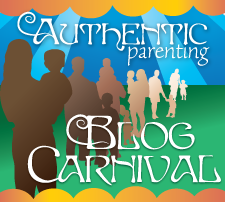 Visit Living Peacefully with Children and Authentic Parenting to find out how you can participate in next month’s Authentic Parenting Blog Carnival, when we discuss anger! 10 Tips For Babywearing Safety- While wearing those babes, don’t forget these important safety tips! That Mama Gretchen shares her top reminders and welcomes your input too! Benefits of Babywearing - Mandy at Living Peacefully with Children talks about the benefits of babywearing in a way that is easy to inform nay-saying relatives. A Brief History of Babywearing - Jennifer at Hybrid Rasta Mama takes a little look into the fascinating history of babywearing. Babywearing with Rebozos - Survivor at Surviving Mexico–Adventures and Disasters talks about how Mexican women wear their babies with rebozos. Yes, yes, and yes! We believe that our son is as calm and attentive as he is now and so confident in exploring precisely because he was (and still mostly is) carrier everywhere. Mama and papa’s arms have given him a secure base from which to venture out. I especially liked your point about babywearing helping regulate the baby. My son was born at 34 weeks and weighed only 3 pounds 9 oz. Our doctor recommended that we wear the little guy as much as possible (he called it kangarooing) to aid in his growth and development. We did and he sure grew! All so true! And those naysayers who talk about babies not walking because they are worn I take issue with. Both of my worn babies crawled and walked much earlier than their peers! Amen on less crying! Nothing soothes Max more than being wrapped or snuggled in a carrier. Such a great list! I only touched on babywearing with my first two, but this time around I’m so grateful I dove a little deeper. Baby (& mama!) LOVE babywearing!